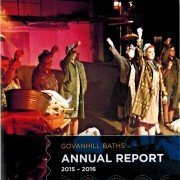 2015-16 has been a remarkable year in the history of the Govanhill Baths Community Trust (GBCT) and the campaign to re-open Govanhill Baths. The GBCT is well on the way to developing the phase 1(b) project to refurbish the Baths, as well as seeing a dramatic increase in the delivery of our well-being intiatives. The last year has seen a Community Engagement involving 1,500 local people to inform the design of the Baths, and nearly 20,000 people visited the building. You can read the full report or download it by clicking the link below. GBCT would like to thank all of our members, supporters, volunteers and the people of Govanhill for their work in helping us exceed our expectations again this year. United We Will Swim! 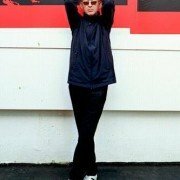 Creation Records guru Alan McGee will be returning to his former home of Govanhill to introduce screenings of “Supersonic” the documentary about his most famous signing, Oasis. Alan famously discovered the Manchester band when they were a support act at King Tuts in Glasgow. He used to live on Allison Street in Govanhill and, as a child, learned to swim in Govanhill Pool. He told the Daily Record how he and Primal Scream’s Bobby Gillespie would hang out in the baths almost 40 years ago. Alan said: “Bobby and I would come in when we were kids and I remember it like yesterday, before we spent all our time listening to records. It’s a unique place, it would have been a national disbgrace if it had been demolished”. Fatima Uygun, General Manager of Govanhill Baths Community Trust said: “Alan is a supporter of our campaign and we can’t wait to welcome him home for this one-off event. He took the initiative to organise this, to raise much needed funds are awareness for the Baths. We are very grateful to him – his energy and enthusiasm gives us a real lift”. The screenings take place on Tue 22nd November in the rags to Riches studio at the Baths.